Unlimited Tastings from 80+ Craft Beers, Free Fair Admission, Commemorative Glass, Music, Games, Dancing and More! Tickets on Sale Wednesday, April 11! Following another record-breaking year, the 5th Annual Brew Hee Haw Craft Beer Roundup will return to the world-famous OC Fair opening weekend on July 14 and 15, 2018 with more fun than ever before. 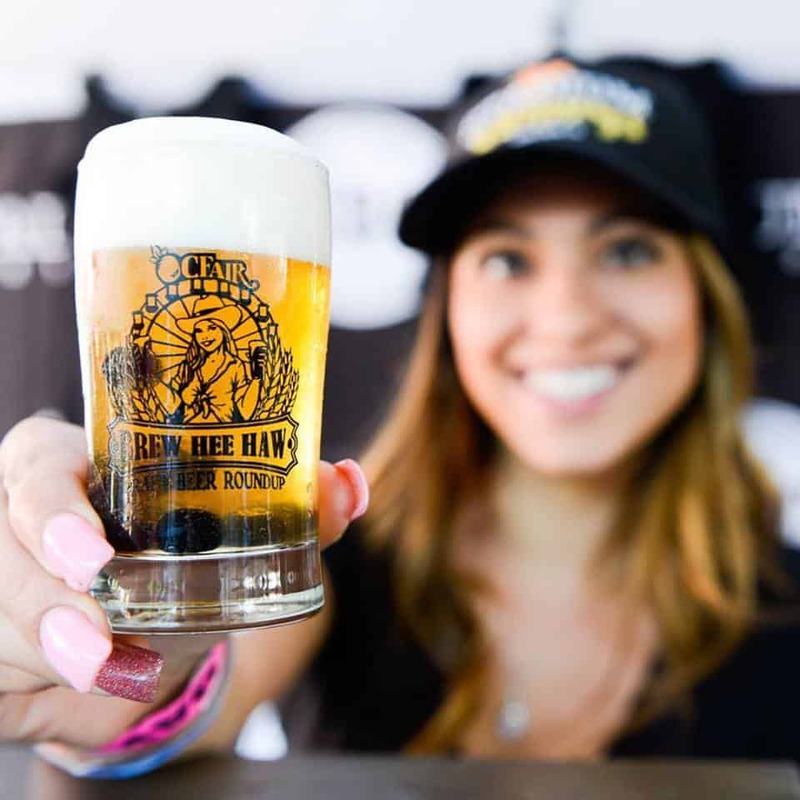 The successful, award-winning collaboration between Brew Ha Ha Productions and OC Fair & Event Center offers four hours of unlimited tastings, a commemorative tasting glass and free admission to the OC Fair. Awarded 1st Place at the Western Fairs Association’s Annual Convention for Best Event Within an Event, Brew Hee Haw features dancing, fun games, and unlimited tastings from some of the country’s top breweries. Tickets are available April 11 at brewheehaw.com. At the highly anticipated 5th Annual Brew Hee Haw Craft Beer Roundup, attendees will have the opportunity to enjoy unlimited tastes of more than 80 craft beers with a wide selection of styles ranging from pale ales, IPAs, stouts, saisons, hefeweizens and many more. Located next to the scenic and spacious Pacific Amphitheatre, craft beer enthusiasts can enjoy sips from their favorite brewers throughout Southern California and beyond, including Artifex Brewery, Chapman Crafted Beer, Four Sons Brewing, Faction Brewing, Beachwood Brewing, Stone Brewing Co., Unsung Brewing Co., and many more. Festivalgoers will have their choice of three different tasting sessions with two sessions on Saturday, July 14 and one session on Sunday, July 15. In addition to fun games and catchy tunes, guests will enjoy four hours of unlimited tastings and a commemorative festival glass. Tickets also include free OC Fair admission so attendees can come for the beer and stay for the Fair! The OC Fair is open Wednesday-Sunday, July 13-August 12, 2018. Tickets are available for purchase at ocfair.com or from the on-site Box Office (limited hours.) Free parking and shuttle services are available on Saturdays and Sundays from the Experian parking structure located off the Bristol St. exit off the 405 freeway. OC Fair Express bus service runs on Saturdays and Sundays from July 14 – August 12 from approximately 10 a.m. to midnight. Departing from nine locations, OC Fair Express costs $2 each way, or 75 cents for seniors over the age of 60 and persons with disabilities. The OC Fair & Event Center is located off the 405 and 55 freeways at 88 Fair Drive in Costa Mesa. For more information, please visit ocfair.com, become a fan at Facebook.com/OCFair, follow at twitter.com/ocfair or call (714) 708-1500. Also, download the free OC Fair iPhone and Android apps. For the fourth year in a row, the Big Brothers Big Sisters of OC & Inland Empire are partnering with the Brew Hee Haw team and will receive a portion of the proceeds. Tickets to the 5th Annual Brew Hee Haw at the OC Fair are available for purchase on Wednesday, April 11 at BrewHeeHaw.com. Limited early bird tickets are $45 online. Regular ticket prices are $55 each and, if available, day-of prices are $65 each. The 5th Annual Brew Hee Haw is a 21 and over only event. IDs will be checked. The Brew Ha Ha Productions team reminds all attendees to drink responsibly. Big Brothers Big Sisters of Orange County and Inland Empire (BBBS) believes that all children should have the opportunity to succeed in life and live up to their full potential. Big Brothers Big Sister of Orange County; Inland Empire was founded in 1958 and is one of the national organization’s top mentoring agencies in the country, serving more than 2,700 children each year. Their Purpose is for every child to have the opportunity to succeed in life and live up to their full potential. Their Mission is to provide strong and enduring, one-to-one, professionally supported mentoring relationships for every child who needs and wants one. Lightning In a Bottle Official Video Has Arrived!